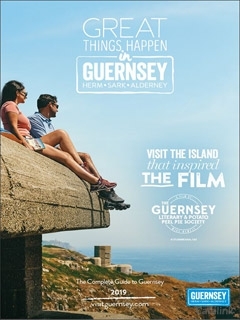 To order a printed copy of the Visit Guernsey brochure, simply click the Request button below. Go Do Great Things in Guernsey! Explore impressive coastlines and unspoiled beaches; meander cobbled streets and delve into Guernsey's up and coming culinary scene. Whether you are looking for relaxation or exhilaration, you can find it on one of the Bailiwick's five Islands. With a warmer climate than the UK and around 2,000 hours of sunshine each year, a trip to Guernsey could take you as little as 45 minutes. Breeze through the airport or harbour port, and you will soon find yourself in the heart of the Island's award-winning capital of St Peter Port - Europe's prettiest harbour town. Famed for fresh crab and local seafood, you will be spoilt for choice when it comes to wining and dining. And why not tuck in with a view? There is no shortage of stunning scenery to take your breath away. Island Hopping couldn't be easier as Guernsey's sister islands can be reached in less than an hour. With no cars, Sark offers an unbeatable escape from the hustle and bustle of working life and Herm could easily be mistaken for the Caribbean with its gold sweeping sands. Alderney is recognised for its rich and varied wildlife, while Lihou is just a short walk away via a cobbled causeway. If you are an avid rambler or casual stroller, then don't miss out on 2019's Spring (25 May - 9 June) and Autumn (14 - 29 Sept) Walking Festivals with over 50 guided walks on offer. Accredited guides will lead the way... and they all have some fantastic tales to tell! People have lived in Guernsey for at least 12,000 years, and with this comes a great deal of history and a fascinating heritage that sets it apart from the rest of Great Britain. Learn more by visiting its beautifully preserved heritage sites and museums. Why not get your adrenaline pumping with one of many outdoor activities? From cycling and surfing to kayaking and windsurfing, your inner adventurer will be reawakened. If you're looking to get away with family, friends, children or a partner, or if you're planning a solo adventure, Guernsey is the place to be all year round. Hop on a bus (only £1 per journey!) or go for a drive to see the sights, take a self-guided 'Tasty Walks' route to uncover the best of Guernsey's food, heritage and landscapes or wander through the bustling town centre. Experience one of many special events and festivals including the Heritage Festival, Seafront Sundays, town carnivals, summer shows and more. Don’t call it a dream. Call it a plan. Order your free brochure today! Visit Guernsey Brochure Patricia T. said: beutifully illustrated and written.made me want to go there and explore. With a wide variety of Best of British parks on offer in locations throughout the UK &#8211; all of them of the highest quality and privately owned &#8211; youre only a few steps away from finding your ideal holiday park. Wiltshire has been a special place for a very long time and our World Heritage Site stands testament to the ages. Download their visitor guide today to explore all they can offer you! From time to time we all need a change of scene. Whether your ideal day out is calming, comforting, refreshing, or bursting with high adrenaline excitement, Wiltshire puts back what the rest of the week takes out. By pressing the Request Printed Brochure button you give consent to Visit Guernsey (and their Data Processors for the specific purpose of delivering your literature) to send you their Brochure . You can change your global communication preferences on your account page.